Demetrious “Mighty Mouse” Johnson now sits with Anderson Silva as one of the most dominant champions of all time, becoming just the second fighter in Ultimate Fighting Championship history to defend the gold a total of ten times. Johnson was absolutely dominant in the main event of “UFC on FOX 24”, pushing a pace from the start that only he could keep up with. 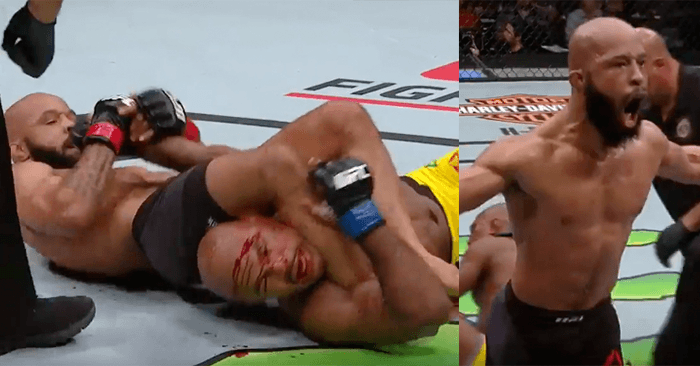 Challenger Wilson Reis tried his best to match the pace of Johnson, but you could see frustration start to build on the face of Reis as the fight progressed. Every single strike that Johnson threw was calculated, and every transition was well thought out. Johnson is as close to a sure-thing as you can get in the world of Las Vegas betting as he has shown no signs of slowing down as the champion. Who do you think Johnson will defend his gold against next? Share your thoughts in the comment section below!